Five years ago, Russia used force against Ukraine to illegally and illegitimately annex Crimea. This violation of Ukraine’s sovereignty and territorial integrity is a serious breach of international law and a major challenge to Euro-Atlantic security. We strongly condemn this act, which we do not and will not recognise. We call on Russia to return control of Crimea to Ukraine. We reiterate our full support for Ukraine’s sovereignty and territorial integrity within its internationally recognised borders and territorial waters. Crimea is the territory of Ukraine. Allies are deeply concerned by the human rights abuses and violations being carried out by the Russian de-facto authorities in illegally annexed Crimea against Ukrainians, the Crimean Tatars, and members of other local communities. These violations include extrajudicial killings, abductions, enforced disappearances, violence, arbitrary detentions, arrest, and torture. Despite the 2017 Order of the International Court of Justice, the Mejlis, the Crimean Tatars’ self-governing body, remains under persecution and is banned in its homeland. We condemn Russia’s ongoing and wide-ranging military build-up in Crimea, and are concerned by Russia’s efforts and stated plans for further military build-up in the Black Sea region. We also condemn Russia’s construction of the Kerch Strait bridge, which represents another violation of Ukraine’s sovereignty and territorial integrity and is imposing additional hardship on Ukraine’s economy. Russia’s unjustified use of military force against Ukrainian ships and naval personnel near the Sea of Azov and the Kerch Strait in November 2018 is part of the larger pattern of Russian aggressive actions in the region. In line with United Nations General Assembly Resolution 73/194 from 17 December 2018, we call on Russia to unconditionally release the Ukrainian crew members it detained, to return the captured vessels and to comply with its international commitments by ensuring unhindered access to Ukrainian ports in the Sea of Azov and allowing freedom of navigation. 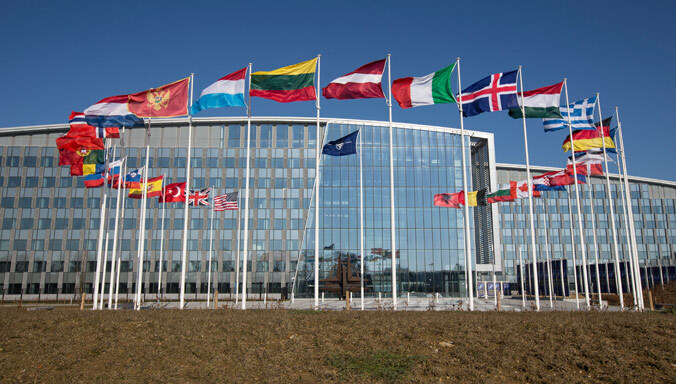 NATO’s response to address Russia’s illegal actions in Ukraine has been alongside and in support of an overall international effort, which has included sanctions. There can be no return to “business as usual” until there is a clear, constructive change in Russia’s actions that demonstrates compliance with international law and its international obligations and responsibilities.